We planted a garden yesterday: peppers, tomatoes, eggplants, cucumbers, and okra. 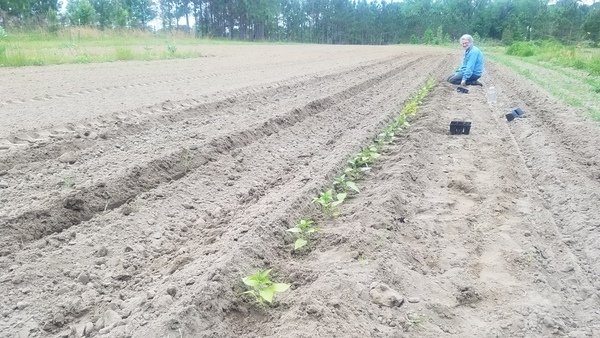 This entry was posted in Garden, Okra, Okra Paradise Farms, Tomato and tagged Brown Dog, cucumber, eggplant, garden, Georgia, Gretchen Quarterman, John S. Quarterman, Lowndes County, Okra, Okra Paradise Farms, pepper, planting, Rain, tomato, Yellow Dog on April 9, 2019 by John S. Quarterman. 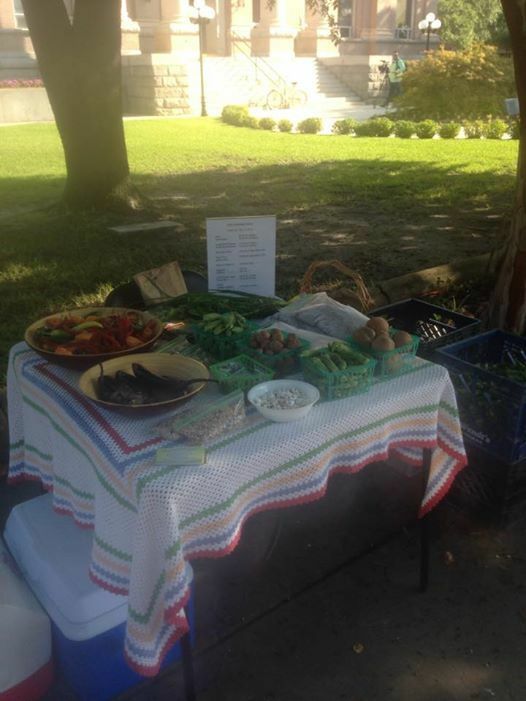 Also rosemary, collard seeds…. A bit muggy, you can tell by the foggy picture Gretchen just took at the historic Lowndes County Courthouse in downtown Valdosta, Georgia. 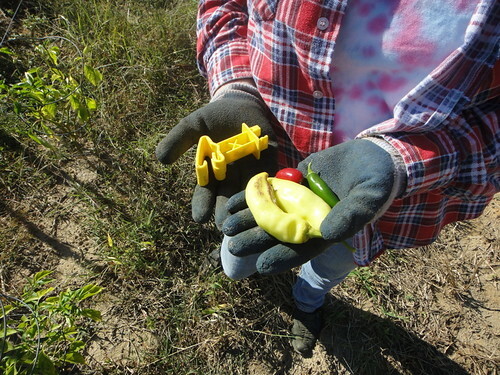 This entry was posted in Corn, Okra, Okra Paradise Farms, Potatoes and tagged Brown Dog, corn, eggplant, Georgia, Gretchen Quarterman, John S. Quarterman, Lowndes County, Okra, Okra Paradise Farms, pepper, Potatoes, Valdosta Farm Days, Yellow Dog on July 18, 2015 by John S. Quarterman. 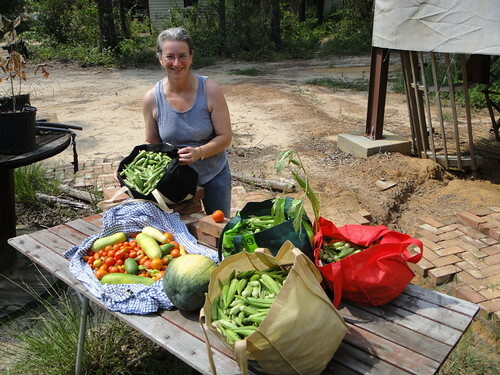 by John S. Quarterman for Okra Paradise Farms, Lowndes County, Georgia, 4 August 2012. This entry was posted in Agriculture, Food, Gardening, Okra, Okra Paradise Farms, Peppers, Plants, Solar, Tomato and tagged 3 August 2012, 4 August 2012, Agriculture, dehydrator, Food, Gardening, Georgia, Gretchen Quarterman, John S. Quarterman, Lowndes County, Okra, Okra Paradise Farms, pepper, Plants, Raven Waters, Solar, tomato on August 4, 2012 by John S. Quarterman. Pictures by John S. Quarterman for Okra Paradise Farms, Lowndes County, Georgia, 7 July 2012. This entry was posted in Agriculture, Community, Economy, Food, Gardening, Health, Okra, Okra Paradise Farms, Peppers, Plants, Plowing, Potatoes and tagged 7 July 2012, Agriculture, collards, Community, cornbread, customers, Economy, farmers market, Food, Gardening, Georgia, Gretchen Quarterman, Health, John S. Quarterman, Lowndes County, market, muffins, Okra, Okra Paradise Farms, pepper, Peppers, Plants, Plowing, potato, Potatoes, Terry Davis, Valdosta Farm Days on July 8, 2012 by John S. Quarterman. John S. Quarterman and Gretchen Quarterman with Brown Dog and Yellow Dog. Pictures by John S. Quarterman for Okra Paradise Farms Lowndes County, Georgia, 11 June 2012. This entry was posted in Agriculture, Dogs, Food, Garden, Gardening, weather and tagged 11 June 2012, Brown Dog, cantaloupe, garden, Georgia, Gretchen Quarterman, habanero, John S. Quarterman, Lowndes County, Okra, Okra Paradise Farms, pepper, Pumpkin, Rain, squash, watermelon, Yellow Dog on June 12, 2012 by John S. Quarterman. Which of these things is different? Picture by John S. Quarterman, Lowndes County, Georgia, 6 October 2011. This entry was posted in Agriculture, Gardening, Okra Paradise Farms and tagged 6 October 2011, Georgia, Gretchen Quarterman, insulator, John S. Quarterman, Lowndes County, Okra Paradise Farms, pepper on October 8, 2011 by John S. Quarterman. Picture by John S. Quarterman, Lowndes County, Georgia, 14 July 2011. 20+ pounds of okra, cucumbers, tomatoes, peppers, and a watermelon. This entry was posted in Agriculture, Gardening and tagged 14 July 2011, cucumber, Georgia, Gretchen Quarterman, John S. Quarterman, Lowndes County, Okra, Okra Paradise Farms, pepper, tomato, watermelon on July 17, 2011 by John S. Quarterman.